It's not exactly a secret, but one of my geeky interests has always been flying and planes. I love travelling, but flying to the destination is usually one of the biggest highlights of any trip. I don't go planespotting often - only a handful of times in the past 15 years - but I decided to share a bit of my other geeky interest on my blog too, after a recent planespotting holiday in Madeira. Madeira has a special place in the heart of European planespotters, not because of the number of planes or the variety of airlines or the proportion of widebodies flying there, all of which are a bit underwhelming. No, it's the airport itself, its location and construction, and, most importantly of all, the more-exciting-than-usual approach and variable winds that make the island a bit of a Mecca for aviation enthusiasts. The island is virtually all mountains and valleys. (The plateaus at the top are national parks and nature preservation areas and unsuitable for airport building). The airport is by the coast, with a runway running alongside the coastline. The runway was extended twice. As there was no land to extend it on, the extensions were built on hundreds of 70m-high concrete pillars. Basically, about a third of the airport is built on platform / bridge. Several roads and entertainment facilities are below the runway among the pillars carrying it. Planes landing at the airport either do an approach which involves a u-turn into a very short final approach, or they approach in a less dramatic line, but through an area that seems a lot more plagued by gusts and crosswinds. The U-turn approach involves flying towards the mountains, which can be a bit nerve-racking for passengers. Because of the way the coastline zigs and zags, you can also find locations directly aligned with the runway, and above, from which to take photos of planes approaching and landing. It's not the same as the famous checkerboard hill at the long-closed Hong Kong Kaitak airport, but it's a pretty rare opportunity nonetheless. Oh, and Madeira is a stunning, stunning island. The most spectacular in the Atlantic. If you want sand beaches, you'll have to go to the Canaries or to Porto Santo, and if you want calm nature and few tourists, you should visit the Azores. However, if you love mountains, forests, nature, the sea and spectacular scenery, while also appreciating good weather that never gets too hot or too cold, and being tolerant of relatively high tourist numbers, then Madeira is perfect. If I were religious and believed in Eden, I'm pretty sure Madeira would be it. The island also hosts a variety of festivals - apparently, the New Year's fireworks are world class (and were recently in the Guinness Book of World Records for their scale), there are is a huge island-wide flower festival in spring, etc. etc. 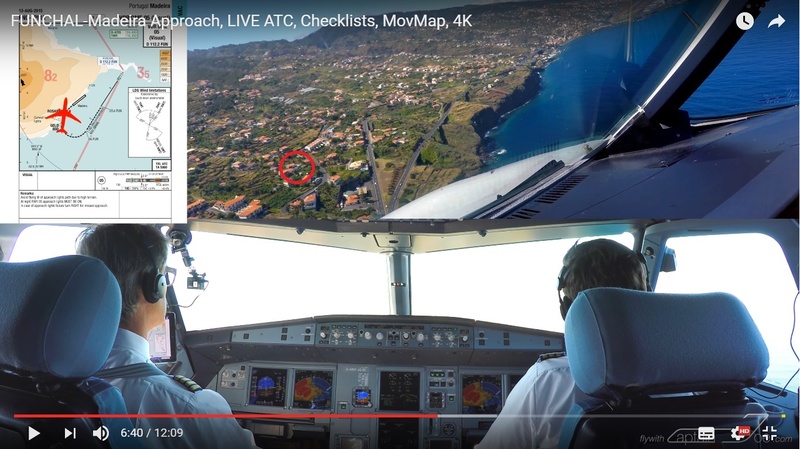 - basically, Madeira is a world class destination even if you aren't a planespotter. Below the break, you will find lots of photos to illustrate the points, and a planespotting travel guide. Flightpaths: See map under 'Spotting Locations' for approximate flight paths. Runway in use: One of the things which may surprise people used to fairly static climates is how often the runway direction can change during the day. Unless the wind is fairly strong and constant in direction, you may find that planes land or takeoff in different directions several times an hour. Expect to have to be flexible about the sort of photos you take, or about where you base yourself. Runway lights: I don't have a radio for listening to ATC, so I used a combination of Flightradar24 and observing the lighting of the runway to figure out where planes were likely to land from. If you're in Gaula, you can see the glide path indicators if they are switched on. At night, you can see the runway lights change depending on which direction they expect planes to land and takeoff in. Runway lights come on about 20 minutes before any arrival and switch off about 5 minutes after a landing if no other plane is on approach. Planes: Depending on the season, there may be the occasional A330 or 787 flying to Madeira, but mostly, you'll see narrowbodies. The biggest plane I saw in December was a 757. Expect A320 series aplenty, from TAP, Easyjet, Thomas Cook and Air Berlin. B737s from Norwegian, TUI, Air Berlin. SATA Dash 8s and a Jetstream shuttling to Porto Santo also visit regularly. Finnair, Edelweiss, BA, Enter Air, Lufthansa, Germania seem to visit weekly or so.The schedules vary every weekday. My impression was that some operators fly in en masse on two or three days a week, from all over Europe, but are then unseen for the rest of the week. Check timetables. I think Mondays were busiest, with Fridays not too far behind. Timings: There were usually two flights arriving around 8am, then a break. During the day, there would be hours with 4-6 movements, followed by a quiet 90 minutes or so, followed by another busy(ish) hour or two. In the evening, the last flights land between 11pm and midnight, but there's several hours with no flights at all before 11pm. It's worth planning your day in advance, and it's also worth checking on updated ETAs, as many flights land half an hour earlier than scheduled, while others are delayed. Disclaimer: I have visited Madeira in spring (several years ago) and in winter - things may be a bit busier in the summer. However, I get the impression the airport never gets as busy as a Canary Island or Spanish holiday destination. Equipment: There are locations where you can take great photos with limited zoom - say, 100-200mm equivalent on old 35mm cameras. There are also places where a whopper of a zoom lens enables you to take great photos or videos, especially of planes turning and wobbling into their approach. A tripod is massively helpful when shooting from Gaula towards the runway. I found Madeira a bit too warm for long distance photography in spring as heat distortion (those annoying wavy lines) become an issue. However, I found long distance planespotting in December perfectly possible with crisp clear air (while temperatures were pleasantly hovering around 20 degrees Celsius). Weather: Changeable. As mountainous island in the middle of the Atlantic ocean, Madeira can undergo rapid changes in weather, and there can be very local rain clouds and thunderstorms. That said, the weather is mostly lovely on this part of the island - pleasant temperatures, sunny days. Most precipitation on Madeira is through mists rather than heavy rainfall. In December, I found that there would sometimes be a short shower, but during my week long stay there was only one day when it rained for several hours concurrently. The biggest obstacle to long-zoom photography is likely to be the wind - it can be a bit gusty. Other planespotters: You're most likely to encounter other aviation enthusiasts along Santa Catarina Road and on the visitor platform of the airport terminal building. Banging noises & explosions: If you're on Santa Catarina Road or at the airport, you will hear frequent percussive sounds / bangs / small explosions. I guess they're measures to deter birds. The fence is to tall to shoot above it, unless you climb onto something (bus stop roofs, vehicles, step ladders...). Don't climb the fence, obviously. Buses stop at several points along this road - look for buses going through Agua Pena. There is a snack bar serving hot food at the top, where the road turns away from the runway. My verdict: it wasn't my favourite location. The fence and the sun were constant annoyances. It's nice to be close to the planes, but I struggled taking photos here. This may be because I lack skill and speed - I found trying to take pics through a fence, while trying to catch the briefest moment (touchdown) of a fast moving aeroplane very hard. This is, however, the spot most likely to be visited by other people and fellow planespotters - for social people, this is the place to visit first. The spot cam be reached on foot. At the Snack Bar a Torre Santa Cruz, turn off from the main road down the street (towards Machico and Agua de Pena). Continue past the alley (Azinhaga da Torre) and turn right into the next street - Rua da Torre. (Google Maps is lacking in detail here - use Bing Maps instead). This is a residential road with just a few terraced houses (and a few dogs, safely in the guardens, but enthusiastic about barking in defence of their territories). Walk to the very end, where a small footpath goes into the woods towards the runway. It's about 100m or so, and there is a fallen tree across the path (as of December 2016) which you'll have to bow under. The footpath is good otherwise, but might be slippery in rain. Keep heading for the runway & perimeter fence (I recall a spot where the path branched off - you'll want to head straight towards the runway, not zig-zag down the hill). Once you get to the fence, you can walk alongside it on the grass, uphill, until you have a great view of the approach and touchdown points of runway 23. This spot is useful for runway 23 landings. Runway 23 takeoffs are OK with lots of zoom - but the plane will disappear behind the hill long before it rotates. Photos of the planes turning around at the end of the runway to line up, with Canical in the background, require some zoom. It's ideal for touchdown photos of landing planes on rwy 23, and for videos of planes wobbling a bit on the final few meters of approach. The spot is useless if runway 05 is in use. My verdict: My favourite location to observe runway 23 landings. Runway 05 landings are more interesting to watch, but if the weather favours runway 23, then this is the perfect spot. The airport runway is on a raised chunk of land (and a raised platform). At its end, the land steeply drops off. There's a road and a bit of Santa Cruz, and then there's the sea. On the other side of a bay, you find the area of Gaula. Behind Gaula, there is a ridge. Planes approaching runnway 05 do their u-turn so that they line up with the runway on the inside of that ridge - they tend to turn just on the inside of Gaula, sometimes just above it. In Gaula, you can find spots that are aligned with the runway and above it in terms of altitude, so you can see the entire runway in the distance, and the bay, and watch planes as they turn to line up. I find it quite thrilling to watch them turn towards me, then just past me, as they line up. My verdict: My favourite location - provided runway 23 is in use. Planes turning into final near / above Gaula are not perhaps at the best angle for photography when they are closest, but watching the final stretch towards the runway in a straight line is worth it, in my opinion. For photos or videos of the landing, a big zoom lens is required. Tip: If you aren't too fussed about being exactly in line with the runway, there are a number of other locations along this road (and the bus route) where you can watch & take photos of planes - some closer to the airport, some further up. For photos, see the gallery I posted below - photos from Panoramic House Syssy are near identical to those taken from the road. There is a viewing terrace on top of the terminal building. It's very wide, doesn't put any glass (or annoying reflections) between people and the view, and is great for taking photos of runway movements and planes at the terminal. The sun is usually behind you, so the light is good (perhaps a little too bright!). The main drawbacks are the usual array of obstructive things (lights, pillars, the odd building). The terrace is split in half, with one half accessible airside, the other without passing through security. However, there are no signs advertising it inside the terminal, so if you are not flying, you need to take the elevator to the top floor marked as "restaurant" (Level 3, I think). If you are flying, the terrace is very easy to find in the departures area. My verdict: A good location that's very easy to access, but you won't get the most spectacular angles from here. I personally prefer the other ones - which are either closer to the touchdown points or offering a more complete view of the approaches and landings. If you want to do lots of tours / excursions, then you'll have to either stay in the main hotel areas around Funchal, or drive / take a bus to Funchal for the morning pick-ups. Gaula (for planes on the u-turn approach: this is the bit of land that planes pass just as they turn into the final approach) - in my opinion, the best possible location is Gaula, as you get to have an overview of all landings and takeoffs. Runway 05 landings are ideal to observe. Santa Cruz (this is the nearest town to the airport). These are not resort / hotel-rich towns. Most hotels are in the coastal stretch from Funchal to Camera dos Lobos - far away from the airport. However, you will be able to find a number of places on AirBnB and Booking.com. My personal recommendation is Panoramic House "Syssy", which is in Gaula, and perfectly aligned with the runway. You can watch the planes from the bedroom or the veranda. It's a short flight of stairs above the road (not suitable for mobility impaired people, sadly), right next to the bus stop for Lombadinha (Gaula). If, like me, you travel without renting a car, the SAM bus company connects Funchal with the Eastern half of the island. Unfortunately, their website isn't great and the timetables you can find online aren't the best, either. Buses run about every 30 minutes during the week, and about once an hour on Sundays. The routes do vary, and even buses with the same number and destination sometimes take different routes to get there. The good news is that, apart from Express routes, all the relevant buses leaving Funchal go through Gaula (the place lined up with the runway is the Lombadinha stop in Gaula). Later on, some go via Santa Catarina Road (the location parallel to the runway where you can take photos through the fence), while others go via the airport. It's an either-or thing - buses that go to the airport will not go up Santa Catarina Road. I found the best method of working out bus times was to take a photo of the timetable at the bus stop in Funchal. There, you will find a table indicating which buses go to which areas, and when they pass through. If you look at a timetable at a local bus stop, however, there will be much less detail: local timetables usually only show you which buses go to (or from) Funchal. They don't include enough detail about the routes taken by each bus further East/North. Buses in Madeira are coaches. They're old-fashioned and not accessible for mobility impaired people. Spotterguide to Funchal Madeira - Perfect for a first trip, and especially if your camera does not have huge amounts of zoom. Includes details of how to get to another popular spotting location - the footbridge.